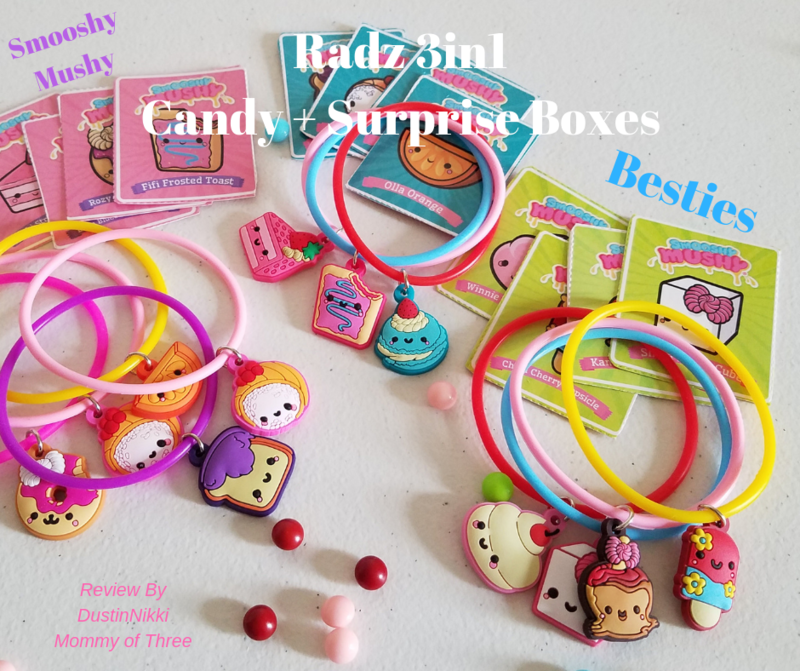 Radz Smooshy Mushy Besties 3in1 Candy+Surprise Boxes are new and they are super cute! These are surprises boxes from Radz and my daughter is newly obsessed with them. 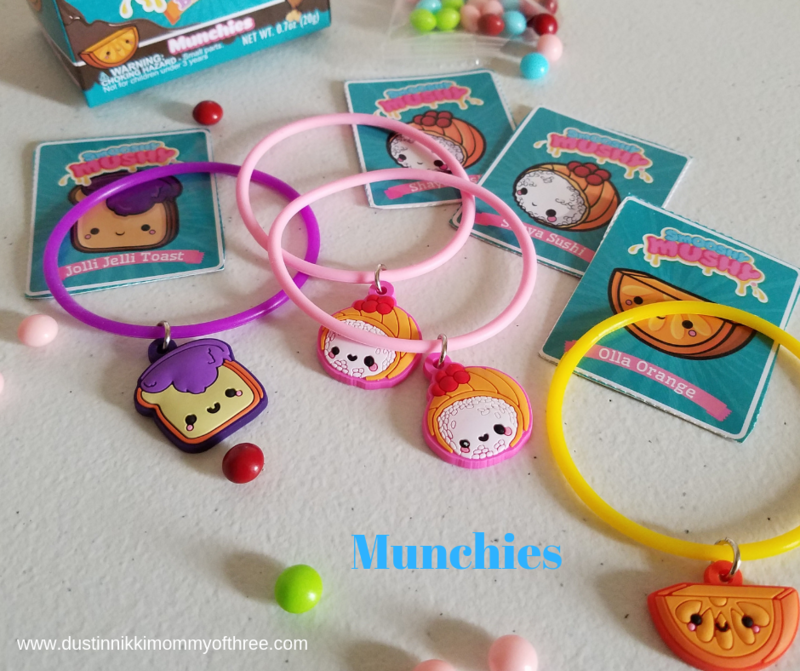 Inside each box there is candy, a collector card, and a really cute bracelet with the most adorable foodie charms! 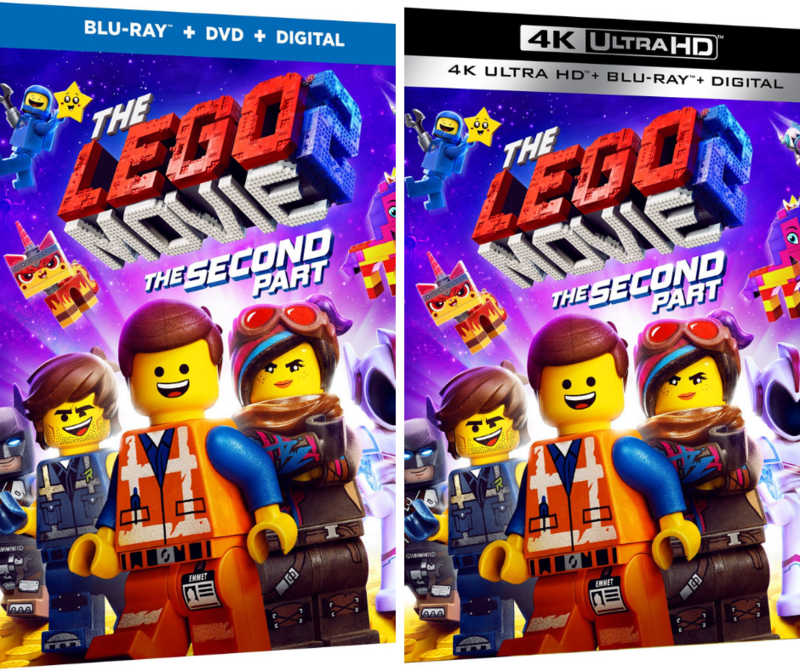 There are three different types of boxes. 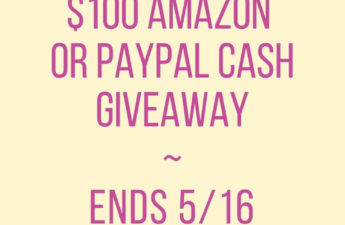 There are Sweeties, Munchies, and Bakies. You can collect a total of 13 charms. The boxes are really cute and they come in three different colors. Each color is a different type of Bestie. They are surprise boxes and you don’t know what charm you will get but I love this concept because you can at least choose the type you want to buy. That way if you are collecting them and are only missing some from certain categories, you can limit the charms you get by purchasing a specific type. 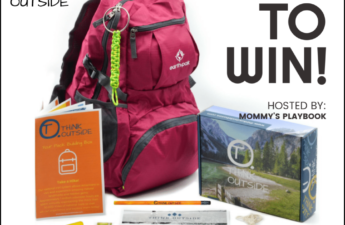 The Bakies come in pink and purple boxes, the Sweeties come in pink and green boxes and the Munchies come in blue boxes. 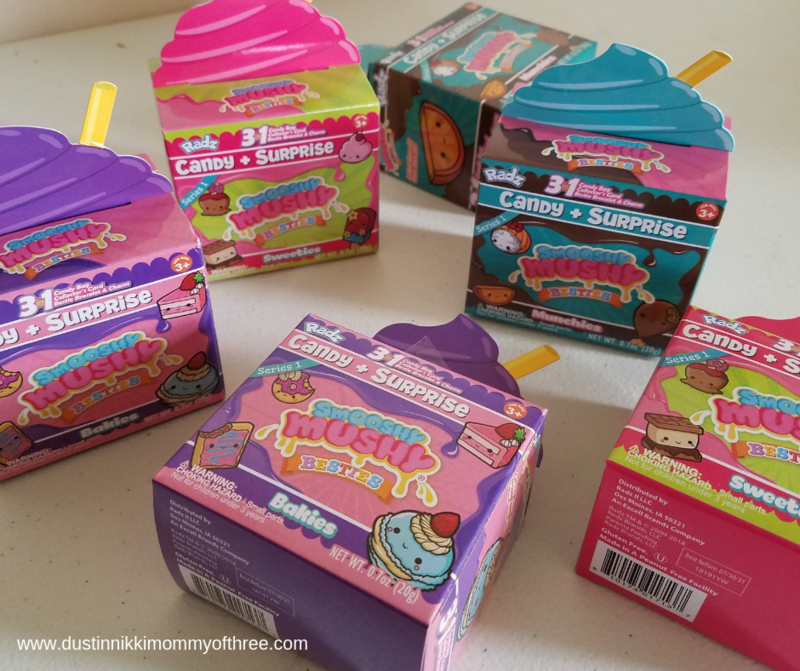 The cards are attached to the “swirly straw” part of the box. When you open them up, you can remove that part of the box and pop the card out. The cards match the charm that is in the box. One the back of each card is also a charm checklist so you can keep track if you are trying to collect them all. The candy is pretty good too. I like Radz candy. It’s a little sweet and tangy at the same time although I think it is more on the sweet side. The candy flavors are; Blueberry Macaron, Candy Apple, Cotton Candy, and Cherry Popsicle. 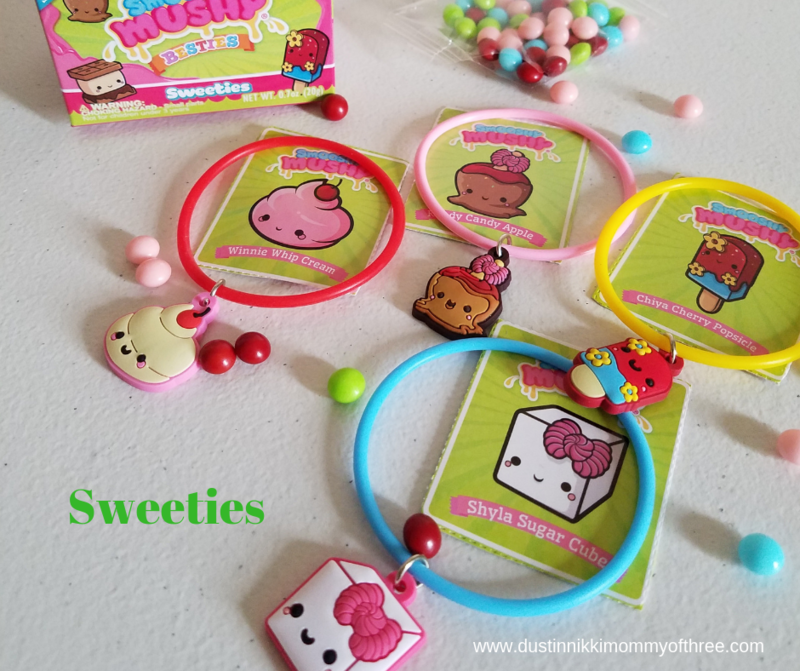 There are five different Sweetie charms. There is a sugar cube with the name of Shyla Sugar Cube. Yes, they all have names! There is also Kandy Candy Apple, Chiya Cherry Popsicle and Winnie Whip Cream. There is one more which my daughter doesn’t have in her collection and that charm looks like a s’mores treat. I’m not sure what that one’s name is because we don’t have it’s card. There are a total of four different Munchies. We have three of the four and they are; Olla Orange, Shayla Sushi, and Jolli Jelli Toast. I absolutely love the Jelly Toast one. That one is one of my personal favorites. I don’t think my daughter has any favorites though because she loves them all. The one we don’t have looks like a chicken drumstick. Since we don’t have that one, I am not sure what that one’s name is. How cute do you think they are so far? The Bakies are even cuter. Like the Munchies, there are a total of four Bakies. We have all four of them so my daughter isn’t missing any of these ones. There is Fifi Frosted Toast, Rozy Razberry Donut, Bella Blueberry Macaron, and Suki Strawberry Cake. I think the Bakies are my favorite ones. How adorable is Bella Blueberry?! The charms are already on the bracelets when you take them out of the box. They are like a rubber which makes them have some elasticity. 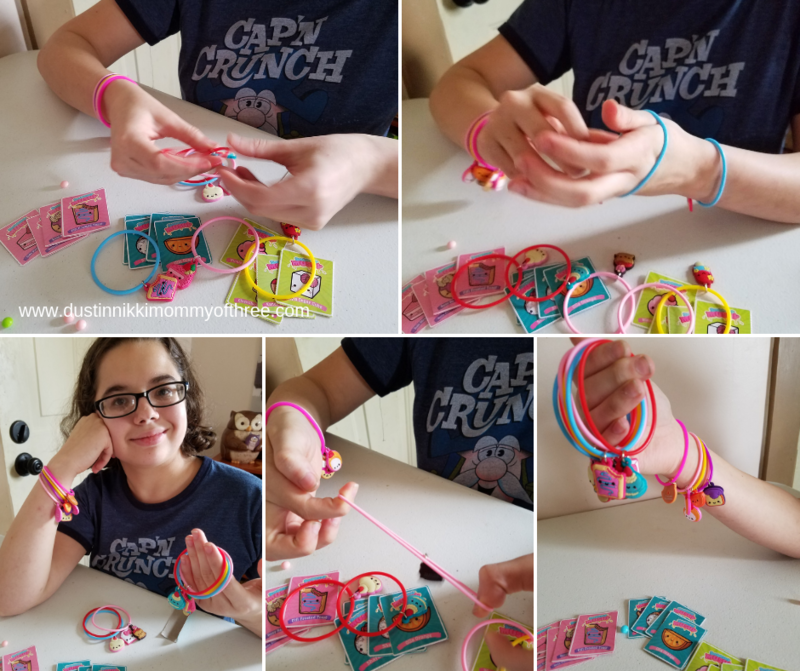 They are easy to stretch to put on any size wrist. 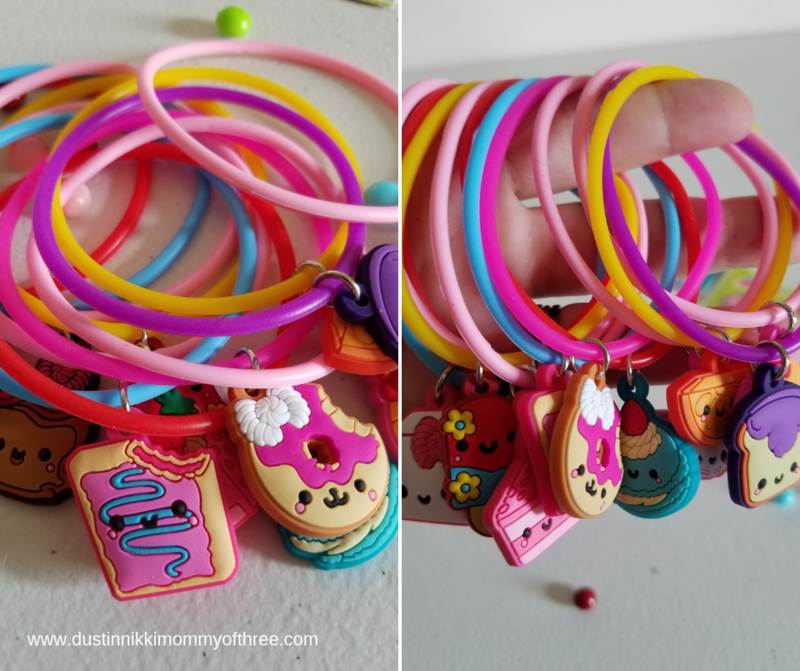 The colors of the bracelets are solid colors in different shades of pinks, purples, blues, and there is also some yellow and red bands as well. 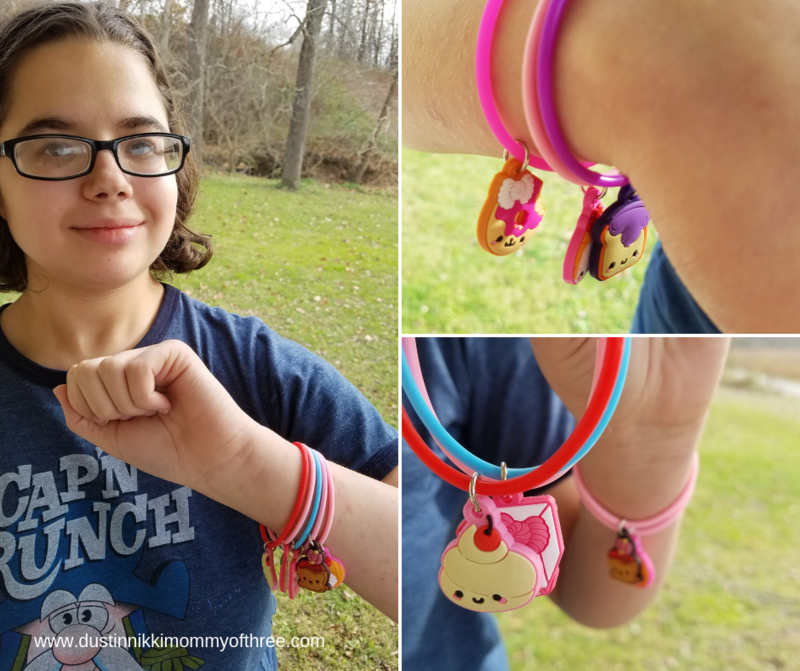 One of the things that my daughter likes about them is that the colors kind of match or go with the colors of each charm. The charms have a little flex to them too. They are attached by a little metal ring. They aren’t meant to just come off and the rings are pretty sturdy. We have never had any issues with the charms coming off. My daughter actually has purposely removed some of the charms so she can put them on zipper pulls on her backpack or other bags. She had to use pliers to bend the ring and bend it back it place. So like I said, pretty durable. My daughter loves them. I think they are fun to collect and they are really adorable. She love the solid colored bands. She always wears these kind of bracelets all the time. 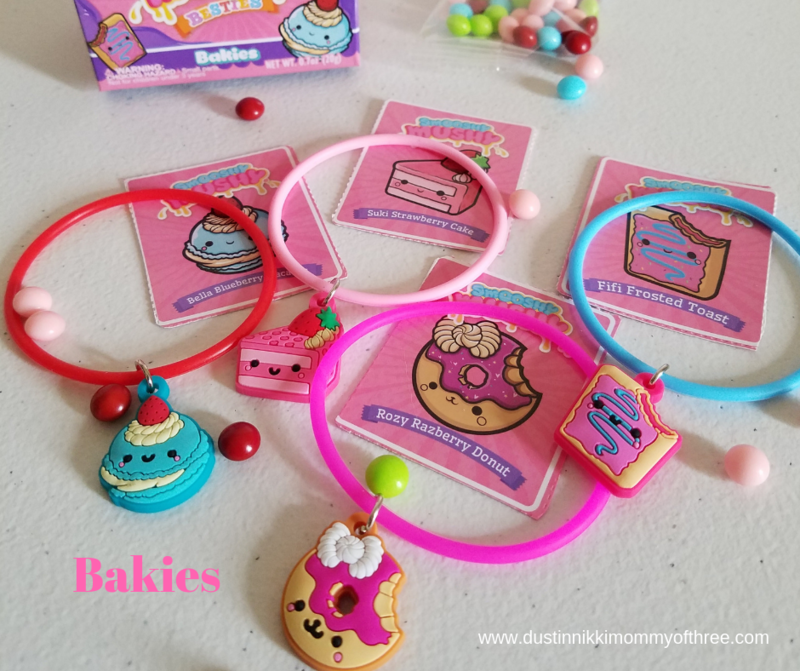 These ones just happen to have super cute foodie charms on them. I just can’t get over how cute they are. She has a couple of the same ones and has given them to me. I removed the charm and added to them to my keyring. I couldn’t help myself. The age recommendations are for ages 3 years and older. I completely agree with the recommendation. I think the bracelets are okay for that age. For kids as young as 3 years, I wanted to note that the candy is a hard candy and the pieces are pretty small. 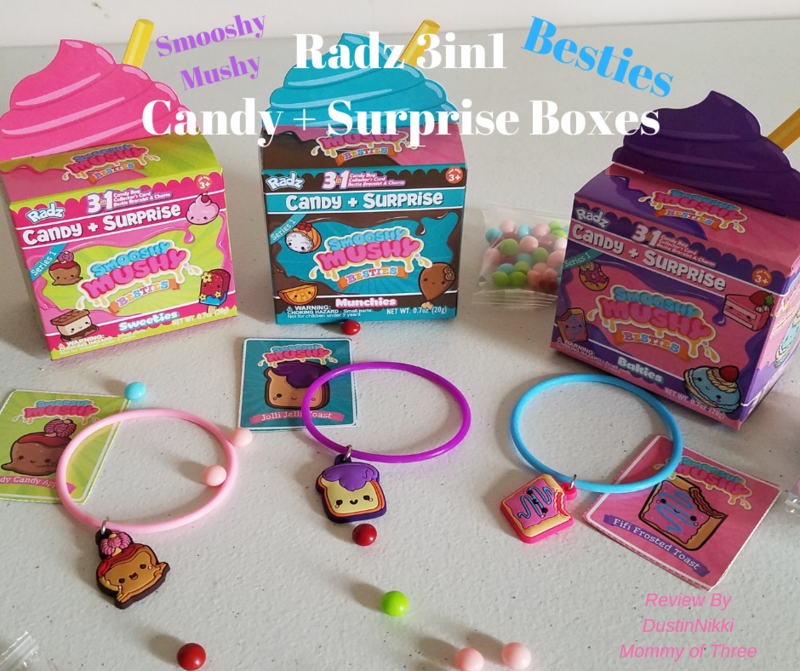 Buy It: You can find these Radz Smooshy Mushy Besties Boxes at Walmart. They are actually a Walmart exclusive so you can only find them there. These boxes can be purchased for $1.98 each.